Contains all the sessions for Sun Records and singles made by Bill Yates in Memphis at the turn of the 1960's and an astonishing collection of unknown and unissued sides. 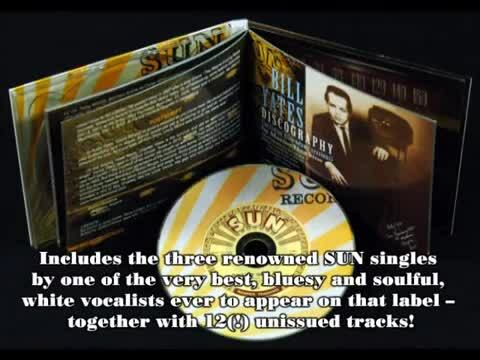 Includes the three renowned Sun singles by one of the very best, bluesy and soulful, white vocalists ever to appear on that label, together with 12 unissued tracks! Plus the three very rare singles on IST and Pixie Records. In addition, there are seven unissued sides made for the Home Of The Blues label in Memphis. In a 48-page booklet, writer Martin Hawkins brings together the untold story of Bill Yates and his music with rare photographs! Bill Yates had a background in gospel music and was an exceptional vocalist and a good pianist. During his time in Memphis, he worked on the edge between the emerging rhythm and blues/soul sound of the city and the late night blues and ballads of the day. His story is told here for the first time. Apart from his three renowned Sun singles, this music is incredibly rare and a welcome addition to the picture of Memphis music at the turn of the 1960s. Bill Yates worked a lot with the Billy Adams band, and there is a companion CD (BCD 17116) containing Billy Adams' part in the story. Note: There are other artists named Bill Yates in the rock and roll history books, principally a bluegrass player, but in Memphis music there was only one Bill Yates. BILL YATES - He was known as Bill Yates in Memphis and on almost of his records, but he was born Billy Vance Yates on December 21, 1936 in Columbus, Georgia. His father, Hubert Vance Yates, was born in Mississippi around 1912 and his mother, Kitty, sic years younger, came from Oklahoma. Hubert was a traveling evangelist who seems to have moved regularly between the area around Columbus, the north Carolinas, and northern Mississippi. At the time of the 1940 census the family was living on Desota Avenue in Kannapolis, North Carolina. Hubert was listed as H.B. Yates employed at the YMCA in an athletic capacity. Billy Vance Yates was the oldest of three children born in Columbus (though, strangely, in a census arror he was recorded as Billy Vance Yates, female). His brother, Leonard Charles, was a couple of years younger and his sister, Carolyn, was a further year younger. These three would be joined in September 1943 by their new young brother, Hubert Vance Yates Jr., known as Vance, born in Kannapolis. ''All three brothers and their sister were interested in music and they all had a natural ability to sing and play'', report Charles Yates' sons, Rusty and Jeff, who are Billy's nephews and musicians themselves. Rusty told Martin Hawkins: ''Their father was a roving evangelist, and the family all sang in church right from the beginning. That was their introduction to music. The family was always traveling, but they spent a lot of time in north Mississippi nor far from Memphis. They were living in Mississippi when they formed a kids' gospel group in church. Charles, Bill and Carolyn were three members, and at one point they drafted in the pre-teen Elvis Presley who went to the same church when Hubert was preaching near Tupelo. The boys all stayed in tough with Elvis in later years''. Trough the 1950s, the Reverend Hubert Yates was based in Columbus, according to the annual City Directories, and it seems that Billy Vance Yates spent most of his teenage years there, honing his musical skills and planning a life as a touring musician. Rusty Yates said, ''In Georgia, Uncle Bill grew up as a natural piano player. But he could play great harmonica and he could play guitar too. Hoe could just do it. He started to play at various places there, and later Uncle Vance started to play with him too''. The events of those years are a little unclear but guitarist James Lucky Ward (who later played with Elvis Presley, Barbi Benton and Janis Joplin) remembered as a teenager, ''toiling in drifter bands behind now-obscure headliners like Hugh Lee Ott, Billy Vance Yates, briefly touted as the white Ray Charles, and Curley Money at Georgia clubs like the Chansaw. Ward played with Money on an unissued Sun session that included ''Chainsaw Charlie''. Local news ads show that Billy Yates and Vance Yates played all along the Georgia coast and into Alabama ant it is likely that Billy made his recording debut as pianist with Jerry Lott who, as The Phantom, recorded the frantic rocker, ''Love Me'' in Mobile in 1958. The record came out on Dot Records and Lott later told Derek Glenister: ''I'm telling you, it was wild. The drummer lost one of his sticks, the guitar player's glasses were hanging sideways over his eyes, and the piano player screamed and knocked his stool over''. By the time Bill Yates had already met and hung out with the big name piano pounder of the era, Jerry Lee Lewis, According to Rusty: ''Uncle Bill moved to Memphis sometime around the mid-1950s. Bill and Vance moved there together. He told me they flat broke and they slept in a car, or in fields by the roadside, just so they could save enough money to get somewhere to stay. They got to know Billy Adams and Uncle Bill and Billy Adams went out on tour with Carl Perkins and Jerry Lee Lewis and others from Memphis. They traveled around in a big old hearse at one tome, Bill told me Jerry Lee Lewis was very unreliable and sometimes he'd be the headliner but when the show started he would not be there, so Bill would go out and do the show for him, Bill could play piano just like Jerry Lee''. In May 1959, Billy Yance Yates was married in Mobile, Alabama to Mary Giles. According to Rusty, ''Uncle Bill and Mary had sons, Dusty (Hubert), and Leslie, and daughters, Tanya and Denise, but in the end Bill didn't stay with Mary''. It seems that Bill was always off on the road somewhere, working in Memphis or elsewhere. By 1961 he had his eyes on Hollywood. The Columbus, Georgia Ledge-Enquirer of July 2, 1961 reported: ''Youths Join Presley Group For Hollywood: Two Columbus youths, Vance Yates Jr., and Bill Vance Yates, have joined the entourage of rock and roll singer Elvis Presley and will soon leave Memphis for Hollywood, where Presley is due to make another movie. Vance Yates Jr. was in Columbus yesterday for a few days before rejoining the band which accompanies Presley at his personal appearance and on recording dates. Young Yates plays the bass fiddle in the four-man band. His brother, Billy Vance, is a bodyguard for Presley''. Rusty Yates confirmed: ''Bill did spend time as Elvis's bodyguard. Bill was a big guy. Bill was always around Elvis and his friends. My father Charles was later in the Speer Quartet, who worked with Elvis, but the one who was closest to him though was Uncle Vance. When Elvis became famous and used to hire out whole movie theatres, then Bill and Vance would always be right there with him. In 1960, when I was about 6 months old, my dad was recording at RCA in Nashville with the Speer Quartet and Elvis came along to listen one day, because he loved that music. Elvis picked me up and said something like ''what a fine boy I was – and then I threw up on him. That's the story anyway''. While Billy and Vance were following the gospel and rhythm and blues or rock and roll, their brother Charles had become a member of the Prophets Quartet, originally from Knoxville, and the famous country gospel group, the Speer Family. Later, during the 1970s, Charles was in Elvis Presley's touring show and after that the Masters Five alongside gospel greats J.D. Sumner and Hovie Lister. Despite his occasional trips away with the Presley entourage, Bill Yates' bread and butter work remained in Memphis. He had a regular gig at the 5 gables Club in the late 1950s where he formed a band known as the T-Birds. Then he hooked up again with drummer Billy Adams, who had just come of the road in 1961 to form a band. Adams band had the resident at Hernando's Hide-A-Way at 3210 Old Hernando Road in south Memphis, a nightclub of some note where the band gave exposure to many up-and-coming Memphis musicians. Rusty Yates remembered visiting his uncle Bill there: ''I know Bill played with Billy Adams a lot. As a boy, about 4 or 5 years old. I remember being taken to a club where Adams had his drums set up, probably the Hide-A-Way, and I sat on Adams' lap and he helped me to play the drums. I remember that we''. Other regular members of the Adams band where bass player Jesse Carter, guitarist Lee Adkins, multiinstrumentalist Gene Parker, and saxophonist Russ Carlton. Jesse Carter remembered: ''I met Bill Yates at the 5 Gables Club when he was playing as a single on South Bellevue. When he later moved to the Hide-A-Away we played together there and then he joined with Adams, and then I did too. His brother Vance Yates would play with us sometimes. He was a great vocalist and bassist, a good man. Bill Yates was a real character, but he also had a great voice and was a good entertainer. He could always liven the crowd up when he came along. He was a great piano player. He came from somewhere around Macon, Georgia and his dad was a Holiness preacher. The family was all into gospel singing. I think that's where he got his presence from, his projection of a song. But he was a shady character – he was unreliable, he might just disappear for a white''. So by 1961, Bill Yates had learned his trade and become part of a band whose musicians were wellrespected and becoming regulars at the recording studios around town. The next step for him was surely to get a recording contract for himself. The established label in Memphis was Sun, followed by the emerging operations at Hi, Stax,or Fernwood. Other smaller fly-by-night labels came and went but one that looked promising had just been operated by Ruben Cherry, and named Home Of The Blues after Cherry's local record store. All through the time he was recording at Sun, Bill Yates worked with the Bill Adams group at Charles Foren's Hernando's Hide-A-Way club, and when Foren established the new Vapors Supper Club on Brooks Road in south Memphis in 1969 Yates ans Adams moved there. By that time, Adams had set up a booking agency, Memphis Artists Attractions, booking Yates and many others locally and across the Holiday Inn network. Memphis's Key TV Guide for April 1973 captured the local scene, carrying ads for the Admiral Benbow lounge – ''Billy Adams' Show and Danceband plays nightly except Sunday... Bill Yates pianist, plays at cocktail time Mon-Fr'' – and for the Downtowner Motor Inn. On Union Avenue – ''the Billy Yates Trio appears from 8 to 1 six nights a week''. That year Adams and Yates were competing with other entertainment, dinning and dancing options that included Linda Ann, vivacious blonde, playing at the Casino Lounge, Eddie Bond and his TV Stompers at the E B Ranch, Charlie Freeman at the Admiral Benbow Club Lounge, Jesse Lopez (brother of Trini Lopez) at the Rivermont Holiday Inn, and Larry Garrett and Lee Adkins at the Vapors''. Eventually, Bill's absences from Memphis grew permanent. At some point, he and Vance Yates worked as the Yates Brothers on shows booked out of Nashville by the Wil-Helm Talent Agency formed by Don Helms and the Wilburn Brothers. It is not clear how long this lasted but it is likely the Yates boys wound up in Las Vegas. By the close of the 1970s Bill Yates had settled there. He lived at various addresses in Vegas through the 1980s, including Ramona Circle and Karen Avenue. His nephew, Rusty confirmed: ''Bill spent a lot of time playing music in the west, especially Las Vegas, from the late 1970s through the 1980s. He was an actor too, and he was an extra and stuntman in the movies. I remembered seeing him in his western gear, mainly westerns. But I remember one time when Batman was in big in the movies they hired Bill to make personal a ppearances at movie theatres as Batman. He'd go in there and leap around and play the part. That was back in the 1960s''. When Bill Yates moved west, his sister Carolyn was also singing in lounges across the country including venues in Vegas and Lake Tahoe. Working as Carol Lee through the 1960s and 1970s, her publicity noted that she was from the backwoods of Georgia and her singing had ''journeyed from the church to the club to concerts'' but that she was ''an entertainer first of all'', singing from songbooks as diverse as Sinatra and Ray Charles. She also sang country, not least her own song ''I Won't Mention It Again'' that stayed at number 1 for thirteen weeks when recorded by Ray Price. It was from Vegas that Bill Yates contacted his nephew Rusty, a budding musician, in 1979: ''I was nearly 20 years old and working for my dad, who wanted me to go into the service. But then Uncle Bill called from Las Vegas and invited me to come out and play music with him there. In January 1980, I arrived and I was expecting to play piano, which was my instrument. But he pointed me to the drum kit and I said I should get on the drums. He needed a drummer. So I did that for a year at the King 8 Casino and then after that I did it a couple years more. The King 8 had opened in 1974 on Tropicana Avenue off the southern end of Vegas' main strip. It was a decent enough venue, if not quite the standard of the International where Elvis Presley had held sway for many years. Bill played little of Presley's music but after Presley died in 1977 Bill recorded four songs: ''Elvis We Miss You'', ''Golden Guitar'', ''Poor But Proud'', and ''Number One Country Music Star''. The recordings were a mix of blues, gospel, and country influences with story lyrics and an intense, conversational vocal style. They were of their time and perhaps typical of part of the Yates act of the day. Rusty Yates said: ''When we were in Vegas, Uncle Bill would play an amazing range of music on piano. He'd play like Liberace and then he'd play like Fats Domino and then he would play George Shearing or some ragtime. He could play it all. He would play his own songs too, sometimes, thing like the ''M&Ms'' song and ''Big Big World'' that was written by his friend Red West''. Al least two of Yates' later recordings were issued. A label called Memphis Country Sights And Sound issued ''Poor But Proud'' and ''Greatest Star Of All'', one an in-vogue nostalgic country song and the other an imaginative tribute to Hank Williams where Yates buys the car Hank took his last journey in. It would make sense that the Elvis tribute was also issued but a copy of that disc is still to be found. The Las Vegas marriage records show that Billy Vance Yates was married twice in the city of the quick ceremony. On July 20, 1985 he married May Elizabeth Nolan and on April 14, 1989 he married Cathy Lynn West. Rusty Yates confirmed: ''Bill didn't stay with Mary when he went away to Vegas. He married there twice but they didn't last. He didn't talk to his first wife for years and didn't stay in touch with his children at that time''. According to Rusty, ''Uncle Bill spent a lot of time out west. After he left Vegas, then he went to Pinedale, Wyoming in the early 1990s. At that time in life he became a ''mountain man'' going on trips into the wilderness and living that kind of life. He and William Golden from the Oak Ridge Boys would do that together sometimes. They's disappear off and live in the hills and made their own leather gear and that sort of things''. In July 2000, the Sublette County Journal carried a feature on an event called the Quick Draw, where local artists and sculptors created works on the spot, using local people and scenes as their inspiration. Their journalist wrote: ''As I stepped up to take a picture of one artist at work, I noticed that the lump of clay before her looked and awful lot like the mountain man who was watching her work. The artist introduced herself as Joyce Killebrew from Sedona, Arizona; then the mountain man spoke. Bill Yates is from Memphis, Tennessee, and had worked with Elvis for six years as a piano player. He then playfully scolded me for taking his picture when he didn't have his teeth in''. The Quick Draw occurred at about the time Bill Yates' health started to nosedive. Rusty said, ''There came a time in Wyoming when Uncle Bill was in failing health. He had diabetes, and someone contacted my dad and said that he needed to be looked after and so his family brought him back to Louisiana. Then he got into contact with his first wife and children again in Mississippi. He had lost both legs and was very ill''. Bill moved to Forrest near Hattiesburg, Mississippi and his daughter Denise Nugend, said ''We were estranged for many years before his illness but I convinced him to move closer to his children. He passed away in 2007 after a long illness''. The Wayne County News reported, ''Graveside funeral service for Bill Yates, 70, of Hattiesburg, were held on Saturday, December 8, 2007, at the Isney (Ala) Cemetery. Born Dec. 21, 1936, Yates was a musician. He died on Wednesday, Dec. 5, 2007, at Forrest General Hospital in Hattiesburg''. To Rusty Yates, ''Uncle Bill was as good a musician as you'd ever hear. He always had places to play in Memphis and in Vegas. But he would just get a hankering yo go and do something else. Wherever he was, he'd just take off from there. Uncle Vance was exactly the same way''. Of the singing Yates family, Charles Yates is the survivor and still an accomplished gospel singer. Vance Yates died in Corpus Christi, Texas in 2012, aged 68. His nephew said, ''He was in very bad health – the conduct of his earlier life caught up with him''. Their sister Carolyn died aged 44, in 1983. But there is a new generation of the musical Yates family. Charles's sons Rusty and Jeff run the Rusty Yates Band out of Baton Rouge, Louisiana. Rusty grew up singing in church where his grandfather preached. He plays keyboards and sings, like his uncle Bill, and has a repertoire that includes a nod to Ray Charles, like his uncle Vance.